It’s moving day! You have lots of boxes to load, and a truck to load them into-but how are they going to fit? Maybe on their ends? Stacked on top of each other? You’ll have to pack your unique truck as tightly as possible, and you lose points for packing too few pieces on your truck, or for leaving pieces you can’t fit behind. Can you pack’em, stack’em and rack’em with the best? 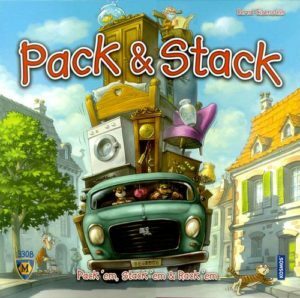 Pack & Stack is a fast and funny, wild and crazy game about moving stuff on all sorts of odd trucks. Every interactive turn is a new adventure, where all the players discover new loads, grab new trucks, and then gamble on their planning and packing skills. So, test your wits and find your cool. It’s time to get packin‘ and start stackin‘!